If you think it's hard to swallow the concept of dark matter, you're not alone. Decades ago, a few astronomers began to suspect that the universe was swarming with some mysterious, invisible substance that was yanking galaxies around with its own powerful gravity. And for those same decades, most of those astronomers' colleagues dismissed the notion as pretty much nuts. But the evidence kept mounting, and nowadays dark matter is a firmly established concept in modern astrophysics. It pretty much has to exist, in fact, to explain why individual galaxies spin as fast as they do without flying apart, and why groups of galaxies move the way they do in relation to one another. If there weren't 10 times as much dark matter as there are stars and gas clouds and other visible matter, the universe would make no sense. Nature abhors irrationality, and so we live in a universe in which just about every galaxy, including the Milky Way, is held safely inside a huge blob of dark matter like a butterfly floating inside a glass paperweight. 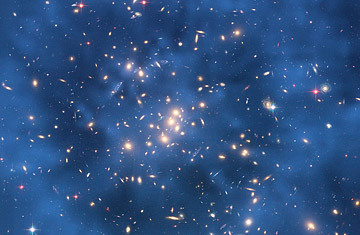 Astrophysicists are also convinced that the dark matter came first, in blobs of various sizes. Those invisible masses then pulled in ordinary matter to make the galaxies. Not all galaxies are created equal, however. Some are pipsqueaks, some are giants and some are true stellar overachievers  so feverishly prolific in their star creation that they churned out up to 1,000 new suns a year for 100 million years. These so-called starburst galaxies have long been a puzzle to astronomers, but a new paper published in Nature may have finally explained them. The answer  once again  is that the dark matter did it. The creation of a starburst galaxy, says study co-author Asantha Cooray of the University of California, Irvine, is all a matter of blob size. If your blob is too big, hydrogen gas can't fall together efficiently enough to sustain a starmaking frenzy. Instead the gas breaks apart to make several separate, reasonably sedate galaxies. If the dark-matter blob is too small, by contrast, the hydrogen falls together too efficiently. Stars form so quickly and so furiously that their heat keeps the rest of hydrogen from falling in. The frenzy is short-lived. Cooray and his colleagues figured all of this out with data from the William Herschel Telescope. The Herschel is sensitive to infrared radiation, a type of light originally discovered by the astronomer William Herschel at the turn of the 19th century  which is why the telescope carries his name. Young, far-off, dusty galaxies are especially bright in infrared, and while the Herschel couldn't generate images of individual galaxies, it could measure brighter and dimmer spots in the overall wash of infrared energy streaming in from across the universe. The brighter spots represent denser clots of galaxies; the dimmer spots are sparse regions. The scientists then compared what they saw with computer simulations of the early universe, which reveal how dark matter should have been distributed. The comparison showed a good match between medium-size lumps of dark matter and starburst galaxies. In other words: the ancient model is consistent with the current reality. "It's not like a new planet, where everyone goes, 'Wow!' " admits Cooray, "but it's a pretty cool result." It's also one that has significant local interest. Billions of years ago, our own Milky Way was one of those starburst galaxies  and since light takes ages to cross the vastness of the cosmos, alien astronomers could even now be receiving images in their own telescopes of the Milky Way in its wild, uninhibited youth.